Documents obtained by Honi Soit have revealed the negotiation process of the student consultative committee over the allocation of the Student Services and Amenities Fee (SSAF), and the final allocation of the fee for 2014. The document also reveals that the total available funding pool increased to $10,970,000 from $10,203,401 in 2013. That pool excludes $2,000,000 separately allocated to the University’s capital sinking fund. This year full-time students will pay $281 in SSAF. $104 of that will go to SUSF, $83 to the USU, $39 to the SRC, $29 to SUPRA, $18 to the Cumberland Student guild, and $8 to Student Support Services. In the vocabulary of Joe Hockey, that’s a lot of beer and cigarettes. The biggest loser in the negotiations was Student Support Services, which voluntarily dropped their allocation by 3 per cent, receiving $296,103 from $305,000 in 2013. All other parties increased their allocations. The Cumberland Student Guild (CSG) made the biggest proportional gain, up 18 per cent to $714,897 from $605,000 in 2013. Trends, however, don’t tell the whole story. Sydney University Sports and Fitness (SUSF), the only organisation without student negotiators, again secured the lion’s share of the allocation. SUSF’s final allocation of $4,060,000 is more than 25 per cent more than the highest recipient, the USU, which received $3,241,000. 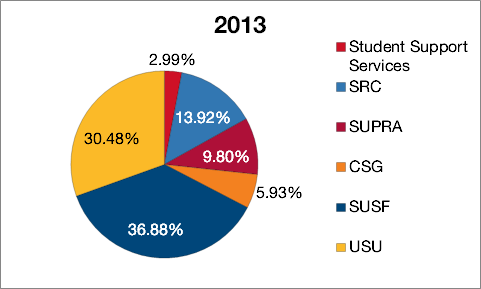 In 2013, SUSF received 21 per cent more than the Union. Sydney University Post Graduate Association (SUPRA) also won out, increasing its allocation by 15 per cent, up to $1,148,000 from a previous $1,000,000. Earlier this year, Joanne Gad, then president of SUPRA, told Honi they needed an increase in funding to provide adequate caseworker services. James Leeder, one of the SRC’s General Secretaries present at SSAF negotiations told Honi the SRC decided to moderate its own request in an effort to work collaboratively with SUPRA, given the particularly low allocation SUPRA has received in past years. Indeed most groups made concessions during negotiations. The CSG, SUSF, SRC, and student support services all eventually dropped their requested allocations, by $47,403, $53,000, $56,000, and $87,897 respectively. The USU bore the biggest reduction, falling $154,000 from their initial request of $3,395,000. Honi understands that better than expected revenue for the Union in early 2014 may have been contributed to this shortfall. Sources close to the Board, however, thought it was unlikely to be the only factor that influenced negotiations. USU President Hannah Morris declined comment on the drop, citing the confidentiality of the negotiations. She did however tell Honi she was content with the final figure, as it was the largest allocation USU has received in its history. Honi has previously reported the USU and SRC received $3,200,000 and $1,510,000 from SSAF, respectively. Negotiations between the parties had previously stalled, resulting in a late determination of SSAF allocations. CSG, SUPRA, and SUSF were contacted but had not responded to Honi’s repeated requests for comment.